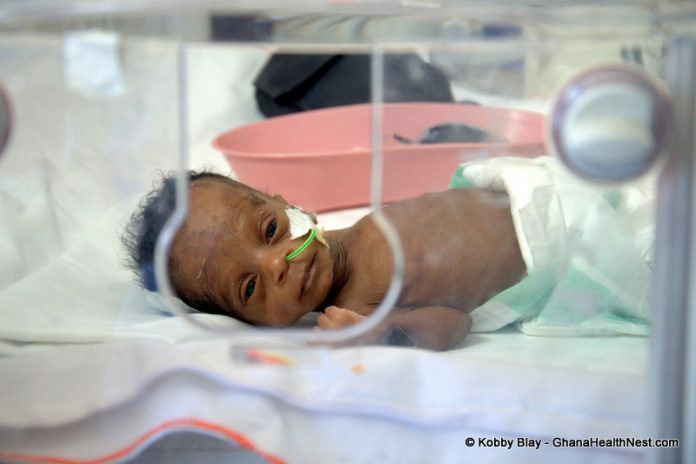 Ghana on November 17 joined the global community to observe the World Prematurity day. A premature baby is born too early, before 37 weeks of pregnancy. Premature babies may need to stay in a Neonatal Intensive Care Units ( NICU) and may have long-term health problems. The World Prematurity day is observed on 17 November each year to raise awareness of preterm birth and the concerns of preterm babies and their families worldwide. The 2017 Global Theme for the occasion is” LET THEM THRIVE! “. The Integrated Youth Needs and Welfare (INTYON) in collaboration with the Ghana Health Service(GHS) with support from UNICEF-Ghana organized the day at Tanga-Pore near Vea in the Bongo District of the Upper East. Historically World Prematurity Day was founded in May 2010 in New York by the European Foundation for the Care of Newborn Infants (EFCNI), Little Big Souls International Charitable Foundation for Africa and March of Dimes, USA. It was officially launched and celebrated as World Prematurity Day in 2011, with the addition of National Premmie Foundation Australia, and has since grown exponentially as a global day around the world marked in more than 50 countries. A full-term pregnancy lasts between 37 and 42 weeks, and “prematurity” describes when a baby is born earlier than 37 weeks (gestational time). Prematurely born infants face many health issues, which can include breathing difficulties, feeding difficulties, and low birth weight among others. Prematurely born babies generally have a longer hospital stay than babies born full-term, and many end up spending more time in the Neonatal Intensive Care Units (NICU) or special care nurseries until it can be established that they are stable and healthy enough to be brought home. This can be a very difficult time for many families. Approximately 15 million babies are born preterm each year, accounting for about one in 10 of all babies born worldwide. According to UNICEF Preterm birth complications are the leading cause of death for children under 5 globally, causing an estimated 1 million deaths in the year 2015. Additionally UNICEF reports indicate that while preterm birth rates are rising in most countries, preterm deaths are concentrated in low and middle-income countries with India, Nigeria and Pakistan accounting for more than half of all deaths Out of the 15 million babies who are born too soon every year, over 1 million die due to complications of preterm birth. Many survivors face a lifetime of disability, including learning disabilities and visual and hearing problems. While other parents are counting happy milestones at baby’s first smile, the parents of premature babies are counting heartbeats. More newborns die from premature birth than from any other cause. According to UNICEF report, in 2015 alone, an estimated 128,000 babies were born prematurely in Ghana and an estimated 8,300 under 5 deaths in 2015 were associated with prematurity . It should be pointed out that the target of reducing neonatal deaths from 32/1000 live births to 21/1000 set in Ghana’s Newborn Care Strategy and Action Plan and the Sustainable Development Goal ( SDG) target for ending preventable newborn and child deaths by 2030 cannot be met without reducing preterm deaths. Arguably too the new global target ending preventable newborn and child deaths by 2030 (SDG 3.2) cannot be met without reducing preterm deaths. Most health experts have attributed the frequent causes of premature births to include vaginal infections which accounts for about 50 per cent of premature births, smoking, diet and stress , multiple births, fertility treatments among others. Whilst Ghana joins the global community to observe the day, one of the interventions that must be considered most in adopting to help address the phenomenon of premature births should the Mother-Baby-Friendly Health Facility Initiative (MBFHI) project being piloted in the Kassena-Nankana West, Bawku, Bongo and the Bolgatanga Municipality. For instance as a result of the intervention in forty- two communities in the Bongo District , more pregnant and delivered women now access antenatal and postnatal care at health facilities than before. The MBFHI intervention is also promoting significantly exclusive breastfeeding and supplementing breastfeeding as well as promoting Kangaroo Mother Care which is effective to substantially reduce neonatal deaths. It should be pointed out that all these are very key in addressing Neonatal mortality amongst preterm babies. Whilst the Integrated Youth Needs and Welfare (INTYON) in partnership with the Ghana Health Service(GHS) is implementing the pilot phase of the project in the Bongo District, the two-year project is also being piloted by other partners and the Ghana Health Service in the Kassena-Nankana West, Bawku and the Bolgatanga Municipality. Speaking to the GNA Mr Isaac Adabre, the Head of GHS in charge of the Bongo-Soe Sub-District attributed the high turnouts of pregnant women and delivered women to accessing the services to the sensitization programmes, drama, focus group discussions, advocacy and the community durbars initiated by INTYON. Whilst lauding the effort of the NGO for supporting the GHS to implement the project, Mr Adabre also paid tribute to UNICEF and the Bill and Melinda Gates Foundation for committing financial support for the implementation of the project. The Head of GHS in charge of the Bongo-Soe Sub-District, however, appealed to UNICEF and the Bill and Melinda Gates Foundation to help scale up the project to the remaining 100 communities in the District to help make more significant impact. The Executive Director of INTYON, Chief Issah Ibrahim, explained that the communities are often empowered to tease out pertinent health issues from focus group discussions and infused them into drama and acted at community durbars to draw the attention of duty bearers such as health workers and the district assemblies as well as traditional rulers to address their health concerns. He cited instances where one of the communities put up drama performance on the negative attitudes of nurses of a health facility at a community durbar that led to the reformation of the character of such nurses. He stated that his outfit was adopting interventions including advocacy and focus group discussions as well as drama to ensure increase demand for ante-natal and post-natal services, early initiation to breast feeding within 30 minutes after birth, exclusive breastfeeding and promoting basic new-born care. The Executive Director reiterated the need for the upscale of the project to the remaining communities in the District so as to help fast-track the attainment of the Sustainable Development Goals of reducing maternal and neonatal deaths. Aside the MBFHI intervention which has the greatest potentials in addressing the phenomenon, there is the need to ensure that healthcare providers are trained to safely identify and manage care for preterm, small and sick newborns ensure health facilities have the equipment and supplies they need so providers can safely care for early/small and sick newborns and ensure communication between health providers and families on preterm babies’ special needs, and provide physical and emotional support to the family. There is also the urgent need to institute measure to measure the performance of staff, facilities and health systems, and set ambitious targets to reduce preterm birth rates, deaths and disability, respectful care encompasses mothers, babies, and families as a unit, from pre-pregnancy through labor, delivery and care of the child. Prioritizing investments in preterm birth prevention and care will improve newborn health and development, reduce maternal mortality and stillbirths, relieve families from untold suffering, and save healthcare systems hundreds of millions of dollars every year. Preconception care package including lifestyle, infection, nutrition and contraception interventions and programs that reduce risks of preterm birth by ensuring optimal health of pregnant women as well as antenatal care packages for all women, including screening for and management of STIs, high blood pressure and diabetes; behavior change for lifestyle risks; and targeted care of women at increased risk of preterm birth should be embraced by all stakeholders. There is the urgent need for government to ensure that women have access to health care facilities with qualified staff, especially qualified midwives, neonatal nurses or other skilled birth attendants; as well as promote the midwife-led continuity of care model. In conclusion the Mother Baby Friendly Health Facility Initiatives (MBFHI) funded by the Bill and Melinda Gates Foundation as well the District League Table (DLT) pioneered by UNICEF and CDD-Ghana need to be urgently scaled up to reverse the trend of preterm birth and to help fast-track the attainment of the SDGs. Previous articleThe Black Friday Has Arrived !